Alrightey, let's get an art thread going! Those of you that watched our streams probably saw when we first showed this one - it's the interior of the Miskatonic Library, and it's very much a work in progress. And here's a new location, erm.. Well, let's just say it's a very early phase of development. Eeeeearly. Right now we're scrambling to get the inevitable forums issues solved, but please know that these posts will be a lot more informative than this, hopefully I'm also happy to answer all questions, except the ones that might severely spoil the game for you, of course. Art thread - that is a great idea. I expect some pretty nice pics to be posted here from SIA. Looking forward to it. I had some intention when looking at the drawing of the new location. A very intense look at the upper right corner seems to confirm this. Great, will love this new location for sure. The work in progress view of the Miskatonic Library looks very good already. A little progress on the above sketch. This is about two hours in. I'm posting it in this state so it isn't spoilery. ...aaah, I can almost smell the mold and feel the wind through the rafters. Speaking of spoiling, if you guys want to, we can split the threads into possible spoiler and non-spoilers. Some folks probably want to be more involved into the development and don't care if they see things ahead of time, some don't. Please let us know what your thoughts are on that! Having choices is always a good thing. It's also best, when the choices are presented so that people, always, understand them correctly. I'm throwing my vote in, yay for spoilers and non-spoilers threads. True, to have a choice is always good. Two separate threads would be great. Maybe even different sub forums so one can decide from topic to topic which version he or she want to take a look at. But if maintaining to versions is very time comsuming for you, only one would be ansolutely fine. And I was just about to throw in another forum request for the spoiler tags. Didn't see an obvious way to do it, and using spoiler tags like I have in other forums hasn't seemed to work. Yes, the spoiler tags will be the best solution. They give flexibility to decide which spoilers one will see and which not and it does not make it neccessary to have two versions of the information provided. Man I wish I could draw even half as well! Love the use of lighting in the top pic, very beautifully eery. Don't forget, they are professional animators so most of us would fall short comparing to their capabilities. The art work for Gibbous is looking soooooo good! Yep, we should use the spoiler tags insted of creating a new topic. Yep, Twitch streams are a-coming! Next one will be tomorrow at 5PM CET/ 12 AM EST. Great, maybe I can hop in to a later time or can watch the recording. Tomorrow the work will prevent me from being home early enough to watch you stream from the beginning. It's not a big problem. You can always watch old streams (as long as Liviu does not forget to save them ) and if you enter the stream in the middle you can still expect a warm welcome. We could also give you a short summary in case you missed something important (like Cami falling from the ball or something ). Hahaha, yeah, I should get the ball back in the streams, it was fun! And it also kept me wide awake, which I wasn't lately. Don't worry Marko, my balance is so good from all this yoga, I couldn't possibly fall from the ball. Or could I? Yup! I'll be doing more cartoonization streams until I get Nicu right, at least. Last night I failed miserably, but it was on purpose so you guys will be more impressed when I do get it right. Hey hey! Thought I'd share a new work-in-progress area with everybody. I won't say where or what this is until we get the spoiler tags in place, obviously. I can tell you that there are about 9 interactive hotspots in this room, and it's a place where something important happens to Don. Ooooh! I love being vague. 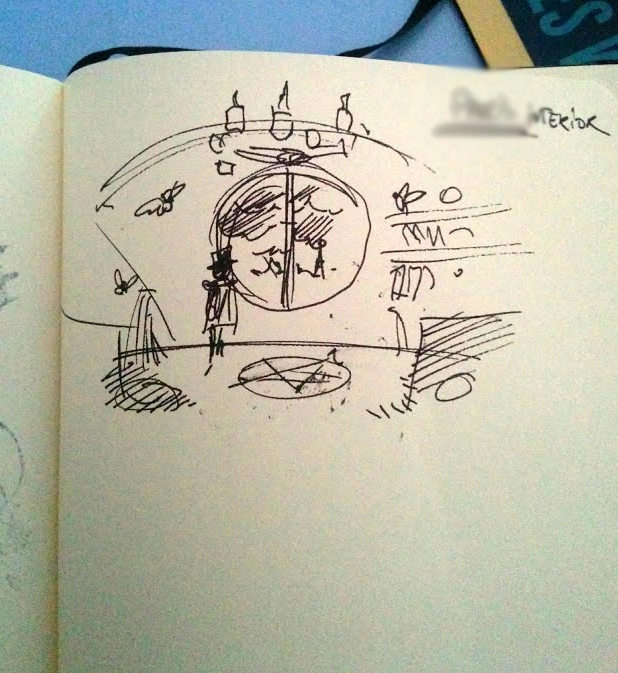 This is the amount of detail I take a sketch to while I'm designing the area and writing descriptions. Basic color helps me get in the mood when writing for it, I've got the main areas mapped and locked down... The bulk of the work is yet to come. I prefer to work with rooms while they're in this stage because if I all of a sudden get an idea or want to add / remove / alter any items or hotpots I'm not losing a lot of previous work. 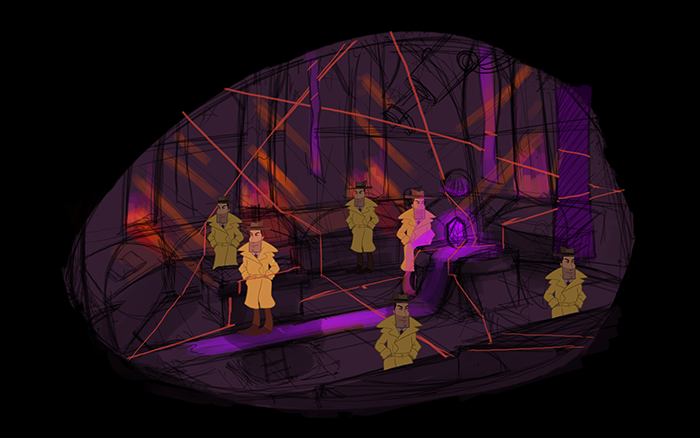 In case you're wondering about the several Dons in the picture, he hasn't been cloned or anything, I just place a lot of instances all over the place to get a feel for how the character's gonna feel, spatially, in the room. It also helps Nicu a lot when he's programming the walk-able area, since basically what he's doing is increasing or decreasing the player character's sprite as it moves on the Z axis (in depth). Well can't get to the Finnish product until you go through the rough stuff first. I love seeing the rough stuff, the behind the scenes stuff, all that. All our life we have seen the final product. It's been rare, or I guess thanks to KS stuff only recently, that we've peeked behind the scenes. Hmm I see 5 obvious spots in that picture. Book, ladder going down, glowy gem, ball on wall, telescope. Maybe the pentagon, the draping carpet thing under the gem running along the floor too.